More people are switching to full face snorkel masks from the more traditional snorkel and mask set. As more full face snorkel masks enter the market, these are becoming more affordable, and the overall quality is improving. In this review, we look at the SeeReef full face mask and compare it to others in is price range. We also delve into the details of how these snorkels work, and how to pick the correct size. 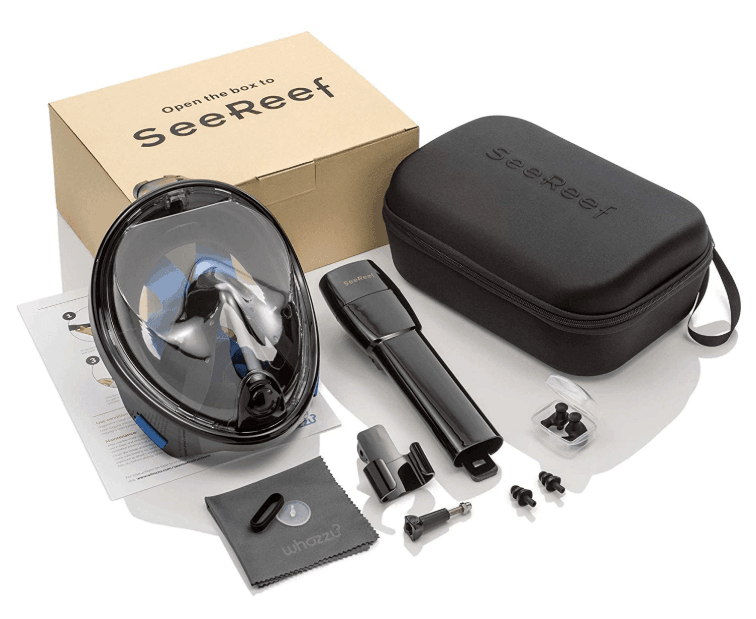 If you already know that the SeeReef Full Face Snorkel Mask is for you, click on the button to see current pricing and any discounts that may apply on Amazon. Click on the table below to go to the answers of your most pressing question, or continue to scroll for the entire review. Which is the best full face snorkel mask? How does the mask and snorkel work? Who the SeeReef Snorkel Mask isn't for? The Verdict - Should you buy a SeeReef Full Face Snorkel Mask? 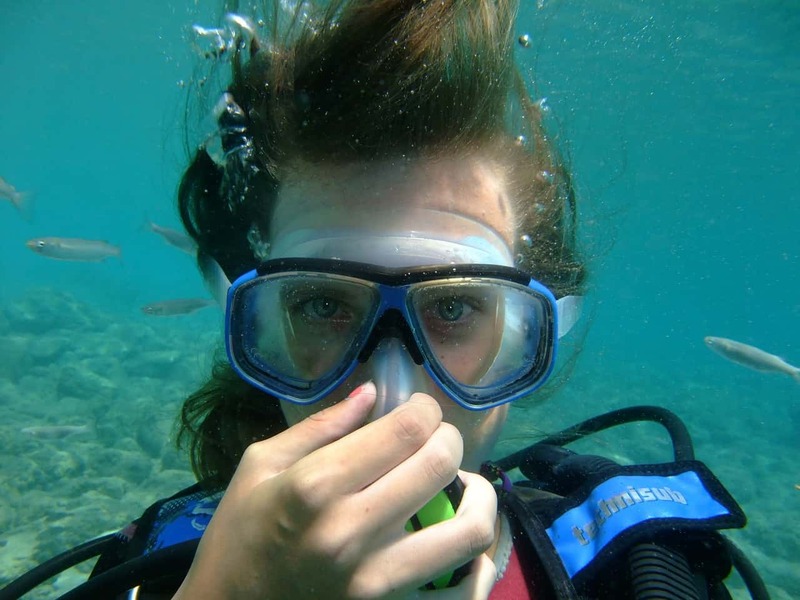 The best full face snorkel mask is the one that fits you properly! Even the best quality, highest priced snorkel mask isn't any good if it's the wrong size. Regardless of the brand, any mask that's not a good fit for your face, will leak water and feel uncomfortable. 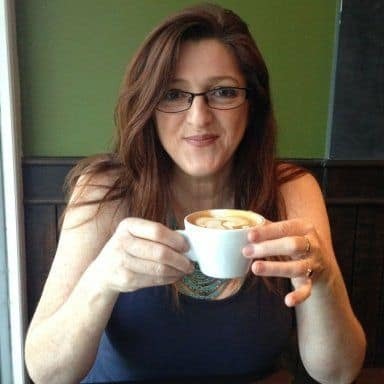 There are slight variations in sizing between manufacturers so follow the size chart of the brand you intend to buy, and make sure they have a good customer service reputation as well as a good Returns Policy. There many good reasons to love full face snorkel masks. Once you try a full face snorkel mask, you'll never want to go back to a conventional mask and mouth piece again. There's no cumbersome mouthpiece or gagging with the full face masks and their design makes it easy and natural to breathe through your nose and mouth when submerged. If you suffer from jaw fatigue or have problems with your teeth, you'll know the pain that comes after clamping down on a mouthpiece for an hour or so. There is no jaw fatigue (or sore teeth) even after hours of snorkeling with a full-face snorkel mask. Most well designed full face snorkel masks have a breathing chamber that is separate from the main viewing section. In most quality masks, this eliminates, or greatly reduces fogging. The field of vision in the new full face masks is unequaled. Many people can feel a little claustrophobic with traditional masks, especially if they have black silicone or rubber skirts. Full face snorkel masks open the underwater world right up. It may look difficult to get the mask on initially, but after a couple of tries, you'll realize it's very easy to put on and adjust. The straps are elastic and won't get caught on your hair. It's very comfortable once in position. Breathing is easy and snorkeling is no longer such hard work. Water will not enter the mask even if you try to take a breath while the snorkel is underwater. Water won't enter the snorkel thanks to a ball float system inside the snorkel. This type of design is called a Dry Top Snorkel. The float rises inside the stop section of the snorkel as you go underwater which generally stops water from getting in. If any water does enter the tube, its channeled down each side of the mask to the chin area. This then drains away through a valve as soon as you lift your head above water. The SeeReef has an extra long snorkel which helps when swimming in choppy water. Regardless of which snorkel mask you look at, there are hundreds of positive reviews on Amazon, but there's also a few complaints among them about leaking. The main reason most full face snorkel masks leak is because they are not the correct size for the person wearing them. 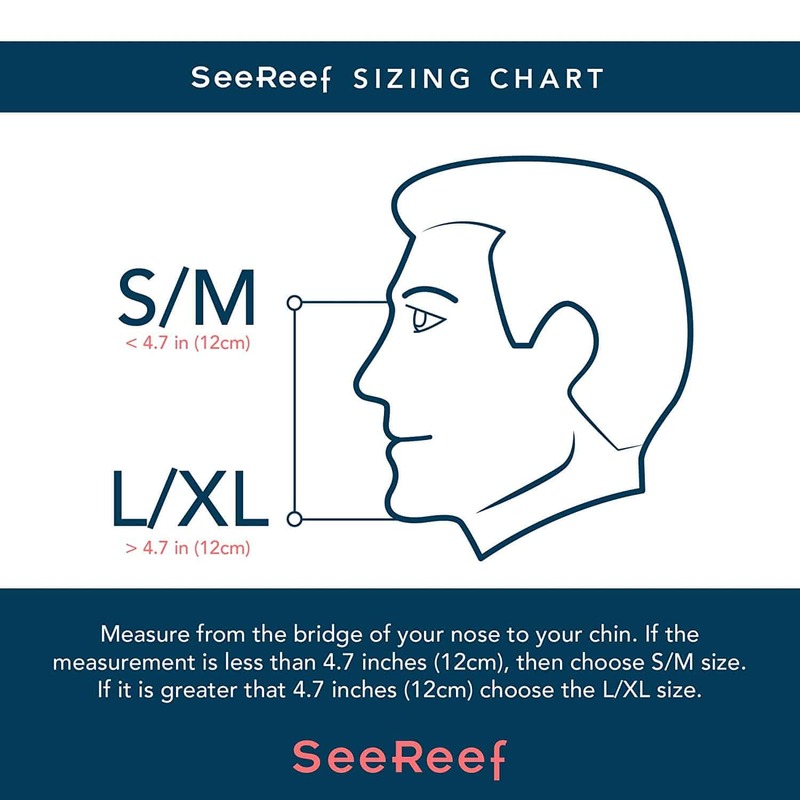 Use the SeeReef snorkel mask Sizing Chart below to select the correct size for you. With your mouth closed, ask someone to measure the distance between the bridge of your nose and the bottom of your chin. Select Size S/M if it measures less than 4.7" (12 cm) - This size will fit most women and teenagers. It fits slim faces. Select Size L/XL if it measures more than 4.7" (12 cm and above), This is generally for men. The SeeReef only comes in these 2 sizes. When you receive your mask, put it on to check that there's no gap between the bottom of the mask and your chin. This is the most common reason for the mask letting in water. 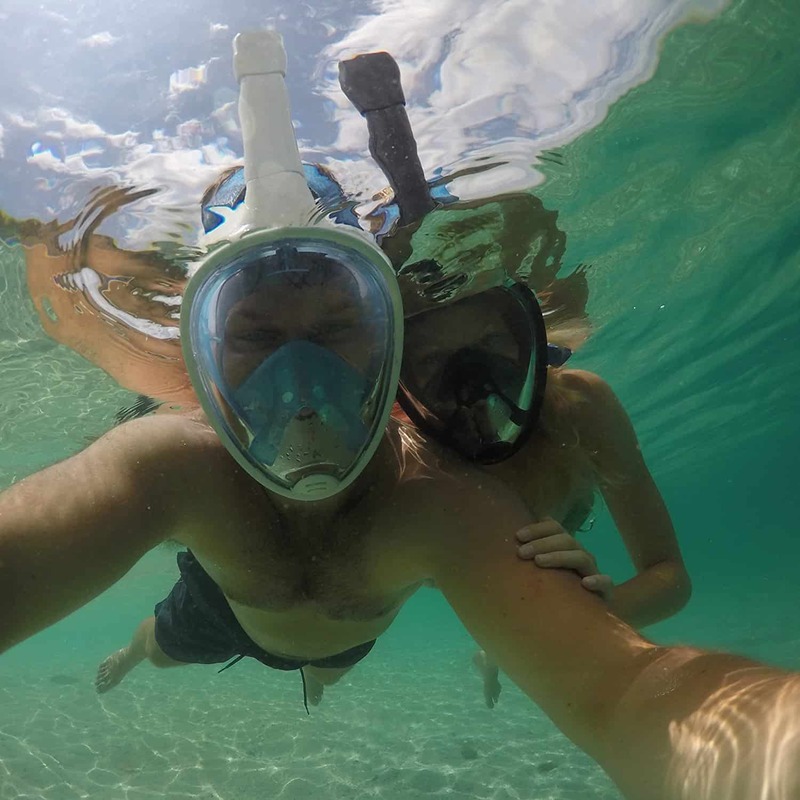 Full face snorkel masks are made for leisurely snorkeling on the waters surface in relatively calm water. Just like conventional style masks, some water will enter the snorkel if you lean your head too far forward. The float system only works when the snorkel is in a vertical position. It can let water into the snorkel when trying to free dive or duck dive. 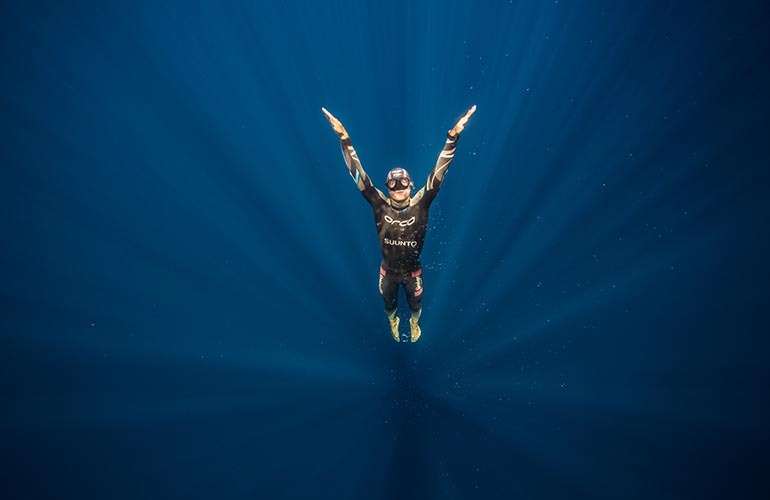 These are not designed for Free Diving. Due to the volume of air inside the face chamber of the mask, these quickly become uncomfortable below depths of 10 feet (3 meters). Beards will cause water to enter the mask. This applies to both traditional masks and full face snorkel masks. Beards create tiny spaces that allow water to slowly seep in. Even if it feels like a tight seal, a fringe or long hair trapped between the silicone of the mask and your skin will let water slowly leak into the mask. Make sure long hair is cleared completely away from the face when putting on the mask. When you not using it, always rest the snorkel mask visor side up as sand and rough surfaces can scratch the visor. Always give it a rinse after swimming in salt water to clear any sand particles that may be in the snorkel and around the silicon skirt. If you find sand in or around the tube, don't force the snorkel piece into place. Give it a quick rinse in fresh water before connecting. Washing in the dishwasher will damage the mask. A quick rinse in fresh water is all it every needs. Make sure you rinse the mask after use even if it's only been in a swimming pool. Store the mask in the storage bag that it came in, and keep it away from sunlight. The SeeReef mask is great for adults and older teens. These do not come in children's sizes. If you're looking for full face snorkel masks for children 12 or younger, then have a look at the Wildhorn Outfitters SeaView, Ocean Reef's Aria or the Usnork snorkel masks, as these all come in smaller XS sizes for children. There is no camera mount included in the snorkel mask, and these no option to include one as an accessory. 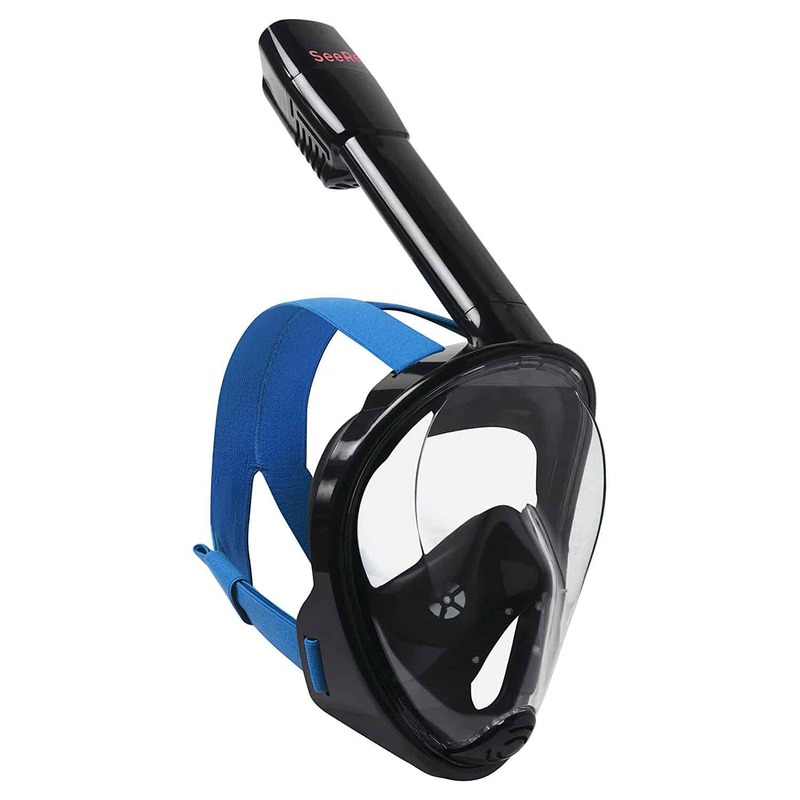 If you're keen to get a snorkel mask with a camera mount, then look at the Wildhorn Outfitters SeaView Snorkel Mask. If you love leisurely surface snorkeling, then the SeeReef is a good mid-price full face snorkel mask. As long as you have the correct size for your face, this is a great purchase! 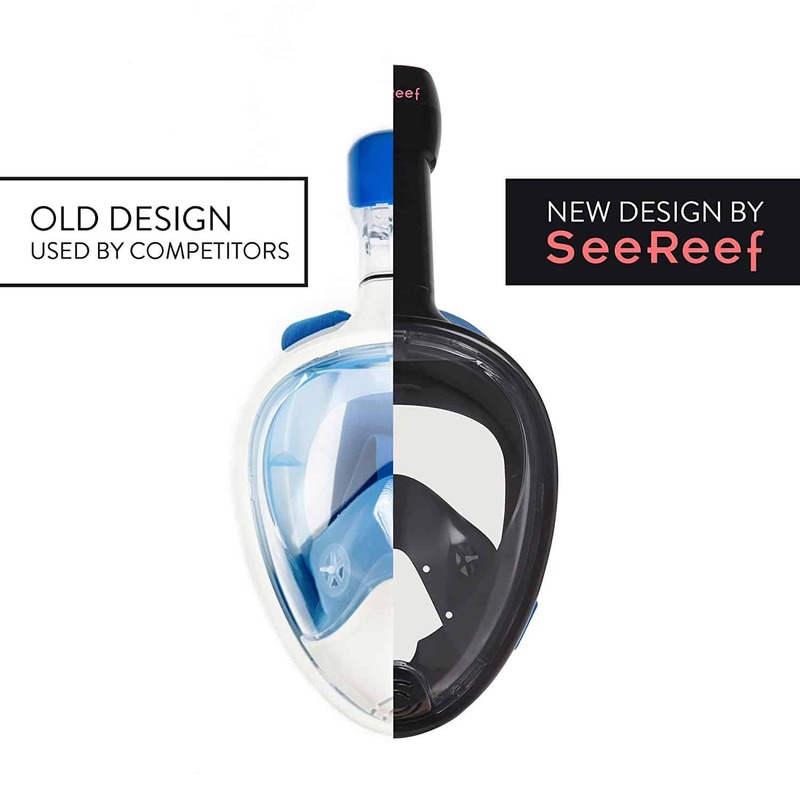 The SeeReef full face snorkel mask comes in two colors and two sizes. It also comes with earplugs, a spare valve and o-ring, and a camera mount accessory. 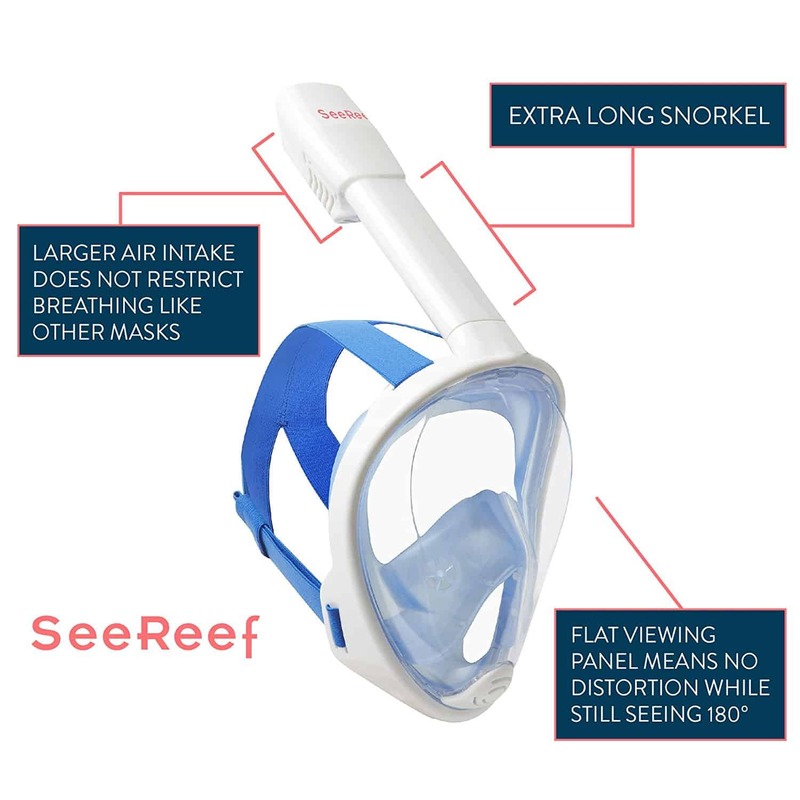 To see the latest price on the SeeReef Anti-Fog Full-Face Snorkel Mask including any discounts that may apply, click the button below. We have 2 of the Aria full face snorkels, and also 2 of the Seereef snorkel. This a really great review, nice and in depth. Thanks. I have purchased 2 Seereef mask and love them. We travel a lot and use them often. I accidentally got tiny pieces of grit/sand/gravel in the ventilation area of the mask and cannot get them out. I have tried to find a contact number or email to someone that can explain how to remove them with out damaging the mask. The debris is causing obstruction to the airflow. Any help??? Do you mean you have grit caught in the snorkel tube? If you can’t remove the grit, then the next best option is to replace the snorkel piece. These can be purchased here: https://amzn.to/2MbXKTh This particular one also comes with spare valves. These are all generally the same size, but by purchasing through Amazon, if it doesn’t fit the SeeReef mask then it can easily be returned for a refund.